Daily Illuminator: Want Car Wars On Kickstarter? 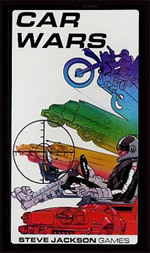 May 7, 2012: Want Car Wars On Kickstarter? Long story short: If the Ogre Kickstarter project hits $700,000, we will schedule Car Wars for 2013. With forums and surveys starting in 2012 to determine exactly what you want. And those forums will be available only to those who support Ogre at the $23 level or above. Not coincidentally, the $23 level does not require you to buy any Ogre stuff you don't want. (It horrifies me that someone might not want Ogre stuff, but we have to admit the possibility.) At the $23 level, you get the shirt that says "I Made Steve Jackson Work On Car Wars." It will be based on the original Car Wars cover. With only four days left in the Kickstarter campaign, this would be a very good idea for you to tweet, or blog, or actually talk to your friends face to face, to make sure they hear about it, because we'd really like to hit that goal (and get past it to the $750K mark, which puts another exclusive sheet in every Kickstarter copy). And we really don't want to get the sad letters saying "Pleeeeeze, I didn't support, but can I get onto those forums and help plan the new Car Wars?" Because that's a big 10-74. Negative. Spread the word now, because time is short!